The Hibiscus Room is a sunny and cheerful room decorated with old Hawaiiana. This room offers a private bath with shower in suite. 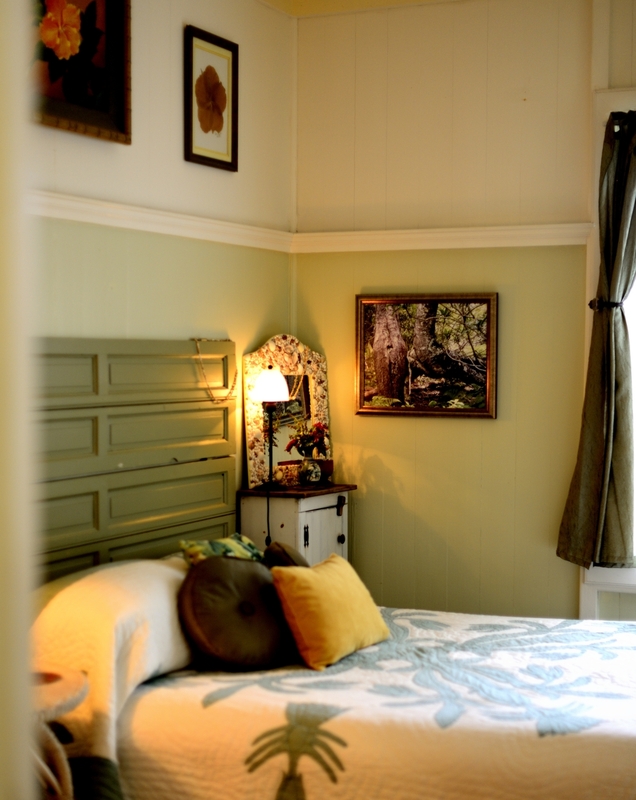 A cozy room for two, the Hibiscus room has queen sized bed and cable TV. The separate entrance opens to a lanai sitting area with a view of Haleakala Crater. Our smallest room is the Hibiscus Room. Business and single travelers enjoy this room. It's cozy with everything one needs for comfort. Couples who don't need to spread out are also quite comfortable in the Hibiscus room. It has a queen bed, and small in suite bath. The bathroom has a newly tiled shower with an open window up high for ventilation and garden view. This sweet room is well lit by the morning sun with a view of the garden, and little pond sitting area outside. The writing desk is under the window looking out on a large Plumeria tree and red Passion flower vines. This room has a bit of a Shabby Chic feel with light green Plantation shutters as a headboard. The art is calm and inspiring. The rocking chair by the window is a comfortable spot for relaxing and reading. The Hibiscus room opens to the shared lanai across the porch from the kitchen entrance. If guests want to come and go, early or late, this is a perfect room. A little sitting area with table and chairs and a small couch for reading are on the porch for guests to enjoy.